The construction of the Panama Canal depicts the largest and most expensive private venture in recent world history. The inauguration of the canal in 1914 was the realization of one of man's dreams, one that was as old as Columbus' travels. Even today, the Panama Canal is considered the most important artificial waterway in the world for civilian and military shipping. Nowadays, the Panama Canal is generally regarded as an engagement of the United States of America. Today, few people are aware that the Panama Canal originated under the Aegis of the French. This canal project was initiated by the Frenchman Count Ferdinand de Lesseps and his Panama Canal Company, going bankrupt 1889. 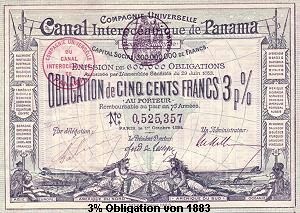 This story reports from a financial historical view, about the initial French canal activities, in the 70's of the 19th century, about the difficulties the French had with the financing and construction of the Panama Canal and about the causes and consequences of the resulting bankruptcy of the French Panama Canal Company in 1889. Over 110 years ago, on 4th February 1889, Count Ferdinand de Lesseps - the celebrated architect of the Suez Canal - went bankrupt along with his Panama Canal Company. The bankruptcy was later noted in history in connection with the Panama scandal. Ferdinand de Lesseps, who was born in Versailles in 1805, followed a career in the French diplomatic service from 1825-1849, with residences in Lisbon, Tunis, Alexandria, Cairo, Rotterdam, Barcelona, Madrid and Rome. Publicly reprimanded for exceeding his competences in 1850, he left the diplomatic corps. His interest was now captivated in a canal through Egypt. Following an invitation from the new Vice King of Egypt - with whom he had become befriended a few years previously - de Lesseps received in 1854 a temporary concession for the construction of a canal through the Isthmus of Suez. In 1858 de Lesseps founded the Suez Canal Company "COMPAGNIE UNIVERSELLE DU CANAL MARITIME DE SUEZ". The canal construction began in 1858, employing periodically, up to 30.000 workers. The opening of the Suez Canal in 1869 followed under worldwide observation, de Lesseps was Europe's hero. Total expenses until the time of opening ran at 432 million gold Francs. Length of the lock-less level canal: 168 kilometers between Port Said and Suez. Earth excavation: 74 million cubic meters. After initial difficulties, the canal was already profitable by 1874. Therefore in the following years the rate of the Suez Canal stocks rose constantly on the Parisian stock exchange. After the English took over financial control of the Suez Canal, de Lesseps' influence disappeared from the Suez Canal Company. De Lesseps then began to develop plans for a Central American canal. Several similar plans were in existence amongst the Spaniards, after Columbus' hearing about an ocean on the other side in 1502. It was the inauguration of the Panama Railroad in 1855, which realized the plans for an interoceanic transport connection in Central America. The 76 kilometers long first American transcontinental railway from ocean to ocean was constructed within five years, without attention was paid to money or human life. It is reported that about 6.000 workers died during the construction work, due to cholera, malaria, dysentery or smallpox. The construction costs U.S. $8 million, making it, per kilometers, the most expensive railway line in the world at that time. The Californian gold rush from 1848 turned the railway into a gold mine. 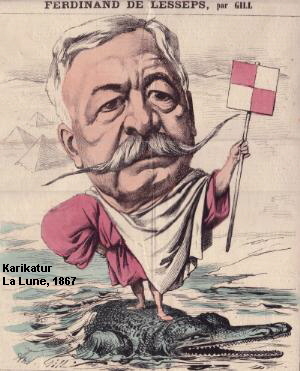 The international geographical congress, spurred on by the Suez Canal, took a particular interest in the question of the Central American canal, in the 70`s of the 19th century and recommended: "a sluice gate canal should only be build there, if it were proven impossible to build a level canal.” Ferdinand de Lesseps headed a committee for the examination of the interoceanic canal question, in Paris in 1876. At the same time a private syndicate was formed, which sent a commission to Panama from 1876-1878, to examine the most reasonable canal route. The syndicate gained a concession contract in 1878 in Bogota; confirmed by the Congress of Columbia: within 14 years a canal should be built through the Isthmus of Panama. The syndicate received the sole rights – with a validity of 99 years - to operate the planned canal. The concession was transferable to private people or another syndicate - and was offered to de Lesseps in 1879. Due to de Lesseps' skilful persuasion tactics, an international geographical congress, which was called upon by de Lesseps, recommended the construction of a level canal from Colon to Panama. The deciding factor, for this conclusion was that according to de Lesseps, only a canal at sea level – like that of Suez - could be constructed, due to geographical concepts. Furthermore, the contract signed with Columbia, the existing Panama Railroad and the two harbor towns, Colon and Panama, which were transit stations, spoke in favor of the Panama line. The same year, Ferdinand de Lesseps took over the canal concession for 10 million gold Francs. The costs for the canal were estimated at 1.2 billion gold Francs at that time; the necessary construction time was estimated at 12 years. Ten years after the completion of the Suez Canal in August 1879, de Lesseps' good reputation alone allowed him to open a private stock issue of over 400 million gold Francs for his planned Panama Canal Company. The issue failed due to the reservation of the French financial world and the press. The subscribers of the stocks received their money back and Ferdinand de Lesseps began his new canal project, this time with much energy in a professional manner. He came to an arrangement with the financial world and the press, held public conferences all over France, and founded a propaganda magazine. A scientific commission followed his work from this moment onwards. The canal plans were discussed and revised once again. In order to impress the public, the 75-year-old de Lesseps traveled along the Isthmus of Panama in 1879/1880 together with an economic commission and members of his family. After his return, he declared euphorically that the canal could be built for 600 million gold Francs within 8 Years. The expected yearly income was noted at 90 million gold Francs and the necessary earth excavation was estimated at 75 million cubic meters. 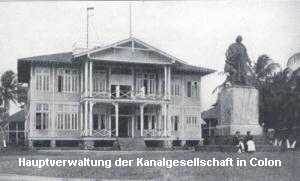 A bank consortium was established to order the stock capital for the new Panama Canal Company, which was to be founded. Supported by the Suez Canal stock bull speculation, the successful de Lesseps attracted many enthusiastic small investors and speculators. 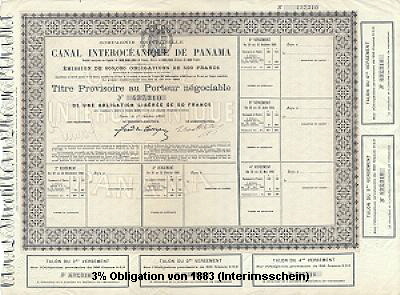 This resulted in the signing of several subscriptions for 600.000 stock certificates of 500 gold Francs each, for the planned Panama Canal Company. 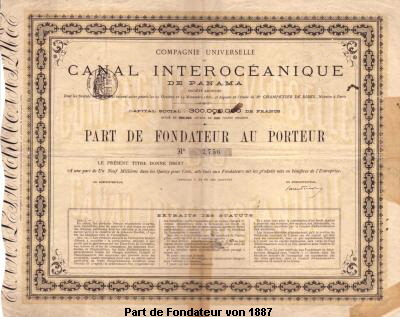 The "COMPAGNIE UNIVERSELLE DU CANAL INTEROCEANIQUE DE PANAMA" was officially founded at the constitutional shareholder meeting in 1881. Its president, Ferdinand de Lesseps, declared that the work should be completed within 6 years. The canal was to be 73 kilometers long and the excavation should not exceed 120 million cubic meters. The canal route was to run along the railway line from Colon on the Atlantic Ocean to Panama on the Pacific Ocean, through the Chagres river valley, and that without locks, on level with the two oceans. The work was appointed to the Belgian construction firm, Couvreux & Hersent, whose reliability was proven during the construction of the Suez Canal. The preparation work for the canal began already in 1881. Then work disruption began due to difficulties from New York because the Panama Railroad, which was in American possession, held the transportation monopoly for the Panama isthmus. In lengthy discussions between Paris and New York, an agreement was reached in June 1881. The Panama Canal Company was forced into taking over the railway, whose capital was now held almost solely in the hands of one speculator, for the totally exaggerated price of $20 million. The actual sale price of the Panama Railroad Company, as calculated per stock certificate, came to $292, at a time when the stocks were quoted at under $100 per stock certificate on the New York stock exchange. In order to finance the purchase of the Panama Railroad and the existing guaranteed dividends, an initial loan issue of 250.000 bonds was floated in 1882 (5% bonds 1882). The earthwork on the canal began in 1882. In October 1883 a second loan issue of 600.000 bonds was floated (3% bonds 1883). In the same time the construction firm, Couvrent & Hersent, who had already realized by this time that the plans could not be fulfilled under such terms, withdrew quietly, but with profit, from the Panama project. The work was transferred to 20 large and small sized construction firms. In September 1884, a third loan issue of 387.000 bonds (4% bonds 1884), followed, which was also completely placed. At the general meeting, in 1885, the company conceded difficulties, for the first time, because the total expenditure would probably amount to 1.2 billion gold Francs instead of the originally planned 600 million. In February 1885, the Eighty years old de Lesseps visited the construction site in Panama. Reports from the general meeting and the press encouraged the investors' money to flow until that year. When it was realized that at this time only one sixth of the excavation work had been completed, the investors became nervous. On the Paris stock exchange, the Panama stocks fell greatly; the company itself was in a crisis. Only 90.000 bonds of the 362.613 from the fourth bond issue floated in April 1886 could be placed (4% bonds 1886). Through an improvement in the conditions of issue, to 6% interest and a reimbursement of 1000 gold Francs on expenditures of 400-460 gold Francs (i.e. 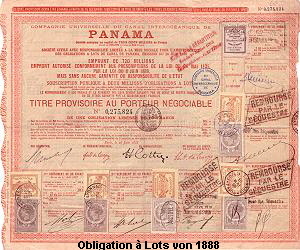 an average yield of some 11%), the three bond series of "OBLIGATIONS NOUVELLES", released one after the other from 1886 to 1888, were placed with increasing success. The 9.000 founder shares of the Panama Canal Company were floated on the stock exchange in August 1887, at a rate of 2.400 gold Francs. The same year, de Lesseps had to abandon his plans for a level canal due to the pressure of the increasingly difficult financial situation. De Lesseps drew up a contract with the famous architect of the Eiffel Tower - the engineer Gustave Eiffel (1832-1923), for the construction of a sluice canal by 1890. The costs for the sluice canal were estimated at approx. 1.6 million gold Francs. Following this news, the Panama stocks reached a new low of 282 gold Francs. In March 1888, several ministers formulated a law allowing the Panama Canal Company to carry out a lucrative lottery loan, with guaranteed funds. Three months later, the Panama Canal Company was authorized by law to set up a government supported lottery loan to the tune of 720 million gold Francs, for the completion of the sluice canal according to Eiffel's plans. In order to escape the imminent insolvency, large sums for bribes were distributed to the press, bank employees and influential politicians, for the promotion of the lottery bonds. Despite all de Lesseps' efforts, the attempt at placing these lottery bonds failed. Only 340 million gold Francs could be floated. The financial situation had become so disastrous by December 1888 that the coupons far the Panama bonds could no longer be served. The company had to stop its payments and tried in vain to receive a three-month payment moratorium. In January 1889 the collapse of the company became reality and Ferdinand de Lesseps resigned from the management. On 4th February 1889, the Tribunal Civile de la Seine lawfully applied for the winding up of the Panama Canal Company in Paris. The work on the isthmus was stopped for the meantime. The lawfully ordered liquidator tried to maintain the work carried out, the buildings, the tools and the machinery. However, within a few years, high losses were incurred due to poor means of protection in the damp, warm climate. The French government pushed the completion of the liquidation further and further away, because the take-over offers of the various American companies seemed too small. An intermediate company was unable to be founded since the necessary capital failed. The liquidator appointed a commission to continue the canal project examination. The commissions report advised in 1890, the continuation of the sluice canal and the renewal of the contract with Columbia. De Lesseps was no engineer. He was an organizer working with uncertain means and daring diplomacy - a visionary founder with an incessant, declared belief in success. He had no technical education and no financial experience. In many important factors, he did not follow the advice of the carefully judging specialists; he preferred to reline his healthy human judgment - proven by the success of the construction of the Suez Canal. Since "Suez". He possessed "the privilege of finding belief in what one maintains, without having to prove oneself". This lead to a majority of capital destroying false estimations and serious false economic and technical decisions. Until today, it still remains unclear whether de Lesseps was a masterful swindler, or whether - due to earlier success - he was a person eaten up by self-deception. De Lesseps orientated himself too strongly on the concept of his Suez Canal - that of a sluice free canal at sea level. After one realized, in 1886, that it would be quicker and less expensive to construct - a sluice canal rather than a level canal, de Lesseps failed to catch the boat. It was only when he was under the pressure of financial difficulties (at the beginning of 1887), that he accepted the plans for a sluice canal. A deciding mistake was the intentional setting of the cost estimation in 1880, at a too low a price, in order to achieve a favorable investment climate. The financial needs of the company, which were realized in 1886, when taking into consideration the necessary sluice devices (1.6 billion gold Francs) differed so greatly from that of the 1879/1880 planned financial volume (600 million gold Francs), that a collapse of the company was unavoidable. Neither the large amounts of capital from the French, nor the State, nor any other financial power from foreign partners, were ready or in a position to produce the necessary participation capital for the canal project. This encouraged de Lesseps to spread the stocks and bonds of the Panama Canal Company as far as possible, further than any other private mission before. De Lesseps' Suez success and his charisma attracted masses of French small investors (pensioners, employees, tradesmen, etc), whose financial means were, however, rather limited. The construction of the canal -as was later in 1887 clear - outran the strength of a private enterprise financed in such a way. The United States of America was reserved towards the French Panama Canal project for political and military reasons, just as the English previously were during the Suez Canal project. Despite several attempts by de Lesseps (including the founding of an American Canal Committee), a reasonable capital participation from America was not succeeded. · Geology/Geography Sufficient geological tests and geographical readings of the canal area were not taken. Earth samples were not carried out to a large enough extent. The volume of earth excavated and the necessary time needed for this work were drastically underestimated. Originally in 1879, 45 million cubic meters were estimated; in 1880, 75 million cubic meters and after a few years work 120 million cubic meters were dug out by the French Panama Canal Company; the Americans dug out another 259 million cubic meters earth by 1914. The climate conditions as well as the earth composition, due to the climate (swamps, drainage), were mistakenly estimated. During the rainstorms in the eight-month rainy period, gigantic landslides and floods caused by the large volume of water from the river Chagres, occurred on the building site. The heterogeneous technical items (e.g. the railway equipment of varying sizes and track widths) together with certain tools and machinery, unsuitable for the tropical conditions, lead to cost extensive works disturbance and limitations. The lack of tropical experience by the French engineers working in Panama, as well as the lack of railway advisers for the organization of the transportation of the excavated earth, delayed the planned work. Medical and hygiene problems (i.e. yellow fever, cholera, malaria, smallpox, dysentery, pneumonia, food poisoning) strongly influenced the efficient action of the workers. The value of the concession acquired from Columbia in 1878, was doubtful, since the transport monopoly on the isthmus was already given to the Panama Railroad. The agreement concerning the transport rights ensued under the pressure of the over-expensive acquisition of the American Panama Railroad. The high issue costs (fees, provisions, advertising, guaranteed dividends, interest service) and the administration costs lead to the fact that only 960 million gold Francs of the floated 1.8 billion gold Francs were productively invested in Panama. Additionally, over 23 million gold Francs were paid to journalists, bankers and politicians, in the form of bribes. The private enterprise received poor support and control from the state. In short it can be said, that without de Lesseps' great success with the construction of the Suez Canal and the bull speculation of the Suez Canal stocks, the plans for the Panama Canal would probably never have been financed by the French nation. There was only one advantage for the Panama Canal in comparison to the Suez Canal: the length of the canal. All other factors, such as the calculation of expenses, the financing, the climate, the earth composition, earth excavation, transport, hygiene, etc, were much more difficult to overcome in Panama. These were - to a certain extent intentional - underestimated. De Lesseps, orientation towards the Suez Canal lead to numerous capital destroying development mistakes, delayed strategic decisions (e.g. with the sluice canal) and too expensive, tactical mistakes on a financial and technical basis. A supply of additional capital in 1888 was no longer possible under the chosen form of financing - bankruptcy was therefore unavoidable. Three years after the collapse of the company, the largest corruption scandal of the 19th century - the Panama scandal - shook the French Republic. The French nationalists accused, in 1892/1893, a large number of ministers (including Clemenceau) of taking bribes from de Lesseps in 1888, for the permit of the lottery issue. This resulted therefore, in a corruption process being held in 1892, against Ferdinand de Lesseps and his son Charles. At the same time, 510 members of parliament - including six ministers - were accused of bribery by the Panama Canal Company, in connection with the course of events concerning the permit for the lottery issue (1888). Large bribery sums were also paid to the press, banks and private persons. Ferdinand de Lesseps, his son Charles, members of the management as well as the entrepreneur, Gustave Eiffel, were at first given high jail sentences. The sentences were later annulled. In the bribery process, the former city development minister, Bethaut, received five years imprisonment, three of which he had to serve. Baron Reinach - the financial adviser of the Canal Company and exerciser of the various bribes – committed suicide. Other defendants fled to England. The remaining investigations into the Panama affair were abandoned in 1894. On 7th December 1894, Ferdinand de Lesseps died. The investigations into the Panama affair were resumed in 1897, however, the defendants were acquitted. In 1894 the liquidator managed to form a New Panama Canal Company (“Company COMPAGNIE NOUVELLE DU CANAL DE PANAMA”). The capital was raised through drawing those who had become rich from the old company into financing the new company and thus dropping the legal process against them. The liquidator from the old Canal Company handed over the building concession, the canal stretch and the Panama Railroad, the machinery and the buildings to the New Panama Canal Company. The new company's business was the maintenance of the existing achievements, the continuity of the contract with Columbia and, if possible, a reasonable liquidation of the bankrupted Panama Canal Company. Work on the canal was taken up again in October 1894. At the beginning of 1895, 500 workers were in employment again on the canal and in 1898, 3400. Reliable reports on the work were written. Between 1895 and 1898, 2.9 million cubic meters of earth were excavated. In 1900, the holding company succeeded in extending the building concession with Columbia, by a further six years - from 1904 to 31st October 1910 - which was taken as the date of completion of the canal. However, the existing capital was insufficient. An increase in the new company's capital was not possible, since the investors' mistrust was too great following the previous events. Only the United States came in question as purchaser of the company. However, England's agreement for this was needed, since the Clayton-Bulwer Treaty of 1850 was still in existence, which specified the neutrality of a future isthmus canal. The commission, lead by the American General Walker and sent in 1899 to examine the canal project, pointed out the important work already carried out on the Panama isthmus; however, the New Panama Canal Company demanded a too high a price (109 million dollars). During the British-American meetings in 1901, the Hay-Pauncefote Treaty replaced the Clayton-Bulwer Treaty. This meant that the United States now held all the necessary rights and authorizations for the construction and running of the Panama canal under its own sovereignty. For political reasons, the commission, under Walker's leadership, decided against the Panama Canal route and recommended the Nicaraguan route, in 1901, for an interoceanic canal. The situation caused the New Panama Canal Company, now under pressure, to take up the American offer of $40 million. Whereupon, the United States decided in favour of the purchase and continuity of the Panama Canal. In 1902, the Spooner Act 1902 was accepted by the Congress in Washington; the production of the Central-American canal, with state aid, thereby became law, The following discussion between the United States and Columbia regarding the transfer of the concession and the bestowal of political rights for the grounds of the Panama Canal proved difficult. In November 1903 there was an bloodless revolution in Panama under the direction of the United States; the Republic of Panama declared its independence. A 16-kilometer wide canal zone in Panama was leased to the United States. The Hay-Bunau Varilla Treaty of February 26, 1904, which was drawn up between the Republic of Panama and the United States of America, allowed the United States of America, in the canal zone, practically unlimited sovereignty with the formal continuity of the territorial sovereignty of Panama, which was to remain for “eternity”. The Panama Canal was built on the basis of this contract. In April 1904, the sale of the canal to the United States of America, including all the installations and rights, was completed by the New Panama Canal Company for $40 million. 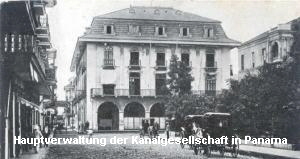 The bondholders of the old canal company received as damages, after 1904, 11% of the proceeds; the shareholders and owners of founder shares went empty handed. The liquidators had handled prudently and business-like, within their power. The United States of America completed the Panama Canal between 1904 and 1914. Sluices and dams, amongst other things, overcame the difficulties, on which the French had stumbled. The total expenditure of the Americans amounted to $386 million. 25.000 workers (including those of the French company) were sacrificed, either through accidents or illness. The canal plays an important role for the United States of America even now, not only for trade between the east and west coast, it is also of great military strategic importance. In 1977 a new Panama Canal Treaty and a "treaty about the continued neutrality and the operation of the Panama Canal" materialized, which gradually was to abolish the absolute rights of the United States of America as acquired in 1903, until the canal was to come under the full control of Panama by January 1, 2000.